Leslie Stahl: So are you ready to compromise? Stahl: What's the difference between "compromise" and "cooperate?" Cantor: Well, I would say cooperate is let's look to where we can move things forward where we agree. Comprising principles, you don't want to ask anybody to do that. That's who they are as their core being. Stahl: But you know, your idol, as I've read anyway, was Ronald Reagan. And he compromised. 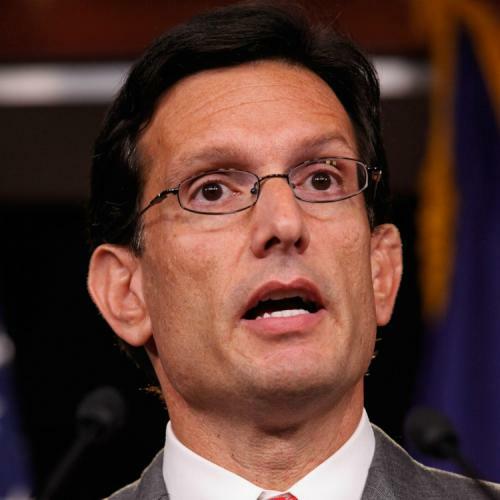 Cantor: Well, he-- he also cut taxes. Press Secretary (offscreen): That just isn't true. And I don't want to let that stand. Stahl: And at that point, Cantor's press secretary interrupted, yelling from off camera that what I was saying wasn't true. Stahl: There seemed to be some difficulty accepting the fact that even though Ronald Reagan cut taxes, he also pushed through several tax increases, including one in 1982 during a recession. Cantor: We as Republicans are not going to support tax increases. Cantor intended to use the interview to warm up his image as a fanatical creep. He let 60 Minutes into his home; he showed America that his mother-in-law lives with his family, just like President Obama's does; he let his wife say she is pro-choice; he talked about being a Jew raised in an overwhelmingly Christian environment. He wore a blue crew-neck sweater. (Putting on a sweater is what politicians do when they want to come across as warm and fuzzy.) The press secretary's interruption spoiled everything. The Reagan record on taxes inhabits the realm not of opinion, where Cantor feels most comfortable, but of verifiable fact. The Gipper cut taxes in 1981, dropping the top marginal rate from 70 percent to 50 percent and eventually to 28 percent. But Reagan also raised taxes many times, most notably in 1982, in what has often been described as the largest peacetime tax hike in history. You sometimes hear conservatives say that the 1982 tax hike is mischaracterized because it mostly cancelled projected tax cuts. That's preposterous. If taxes are scheduled to fall and you cause them not to, that's a tax increase. (By a similar logic, if taxes are scheduled to increase and you cause them not to--as congressional Republicans hope to do by extending the Bush income-tax cuts past their 2013 expiration date--then that's a tax cut, even though Cantor refuses to score it that way in defect negotiations.) And anyway, as the Reagan-era White House and Treasury official Bruce Bartlett has pointed out, Reagan increased taxes ten more times before he left office. By Bartlett's calculations, Reagan's combined tax increases amounted to $132.7 billion. It wasn't nearly enough to undo Reagan's combined $275.1 billion in tax cuts--the Gipper's tax record nets out to $142.4 billion in tax cuts--or Reagan's inability to cut spending in any meaningful way. That's why Reagan's chief domestic legacy is out-of-control deficit spending. Indeed, when Grover Norquist launched his project to name anything and everything after Ronald Reagan I humbly proposed that the deficit be re-christened "the Reagan." If current GOP doctrine were, "It's OK to raise taxes if over the course of two presidential terms the net result is a tax cut" then perhaps it might be deemed unfair to dwell on Reagan's tax increases. But of course that isn't GOP doctrine. GOP doctrine says "It's never okay to raise taxes, ever." Except of course if the tax increase is a payroll tax that the rich don't especially care about because it's capped for Social Security at $106,800 (chump change to any "job creator" worthy of the name). Though by the logic of the previous paragraph I suppose it is more properly described as a reluctance (except under extreme duress) to support the president's proposed tax cut. If Cantor's press secretary wanted to tell Leslie Stahl, "You're omitting the fact that Reagan cut federal taxes substantially for the stinking rich, chiefly through alterations to the corporate income tax that, thank God, got little attention at the time," that would be a fair point. But of course it's a point he would never make. And it still wouldn't make Stahl's point untrue or unfair.